The Black Sun Coral is very intriguing, first in name and then with its gorgeous appearance! The color and growth form of the fascinating Black Sun Coral Tubastraea micranthus will peak the interest of all coral enthusiasts. They are also known as the Branching Black Sun Coral, because they form erect colonies that are richly branched and tree-like. In the wild, these colonies can reach 40" (1 m) in height. At this time, they are the only discovered branching version of this genus. The Black Sun Coral has very fleshy polyps with its corallites, the hard round, tubular structure the polyps live in, situated on the branches. The corallites are covered with a tissue, called the coenosteum. Their polyps tentacles can be a greenish black to brownish black with the very center of the polyps and the coenosteum and being olive green to brownish black. The colors can be variable, but the polyps are not the dark brown or black that can be found on the coenosteum. The polyps of the Black Sun Corals extend mostly during evening hours, though they can be coaxed out during the day if food is present. During the day, the coral is completely withdrawn and only the dark coenosteum is visible, making it look like a tree with raised round flat nubs all over the branches. Other common names these corals are know for are Black Tube Coral, Branching Black Sun Coral, Black Cup Coral, Black Tubastrea, and Green Sun Coral. Although the other species in the Tubastraea genus are referred to as non-reef building corals, or ahermatypic, T. micranthus is actually considered hermatypic or reef building. This is due to the fact that their skeleton is not only denser than the rest of the species in this genus, but denser than most corals on the reef. The T. micranthus are some of the most durable corals in the ocean, resisting damage by the strong forces of nature, like hurricanes and cyclones. Their surprising strength was also noted when, even after nuclear blasts, the T. micranthus was one of only a few corals that were not fully demolished and still adhering to the reef. Despite its hardiness in the wild, the Black Sun Coral is a delicate coral to handle. Its fragile branches will break easily, so It must be moved carefully by picking it up from its underside. 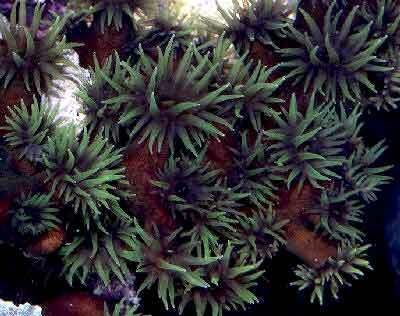 The Black Sun Coral is moderately difficult to care for and labor intensive. It needs several daily feedings, good filtration, a very strong water movement, and regular substantial water changes. In the average aquarium it is near impossible to provide the extreme water movement and extreme amount of food needed for its captive survival. It is only recommended for the advanced aquarist. Its success depends on a very dedicated aquarist who can provide the right environment and the on-going care of this beautiful coral. This is a great video of both Black and Yellow or Orange Sun Corals in the Gulf of Mexico. They have happily attached themselves to an oil rig along. In 1943, the Sun Coral, T. coccinea, was introduced into Atlantic waters and have competed successfully for space with native coral. The Black Sun Coral, T. micranthus, is a recently introduced invasive species, discovered in 2010. They are not native to Atlantic waters, but are originally found in the Indo-Pacific. Black Sun Corals are unlike their sun loving cousins! They are not restricted to areas of sunlight because they are non-symbiotic corals call azooxanthellate species. They are great for building reefs in the wild as a base coral, but need a lot of food to survive! This lack of need for light makes it so that they can live in water that is thousands of feet deep, live in caves and live in colder waters as well. Using the stinging cells on their tentacles they trap live prey in the wild. Feeding them daily. Distribution / Background Tubastraea Coral Information: The Tubastraea genus was described by Lesson in 1829. These corals are referred to as azooxanthellate or non-photosynthetic corals, which means they only survive with foods, and lighting has no affect on their growth. They are also mostly non-reef building corals, or ahermatypic, with the exception of T. micranthus that has a much denser skeleton. The Black Sun Coral Tubastraea micranthus was described by Ehrenberg in 1834. T. micranthus, rather than micrantha, is the spelling that is recognized by ITIS, the Integrated Taxonomic Information System. Some other common names these corals are know for are Black Tube Coral, Branching Black Sun Coral, Black Cup Coral, Black Tubastrea, and Green Sun Coral. Where Tubastraea Corals Are Found: The T. micranthus are found in the Indo-Pacific and the Red Sea. Tubastraea Coral Habitat: The T. micranthus are the deepest dwellers of this genus, being found at 160 feet (50 m). They are found on fore reef surf zones along with other hermatypic corals and reef fauna, in extremely strong waters which flow at a rate of 3 feet per second (1 m per second). This strong laminar flowing water provides the Branching Black Sun Coral with a rich supply of zooplankton at an amount that is near impossible to duplicate in captivity. Status The T. micranthus is not on the IUCN Red List of Endangered Species. Description What do Tubastraea Corals look like: The T. micranthus form branching colonies that can reach 40" (1 m) in height. Their Corallites, or the hard round, tubular structure the polyp lives in, are situated on the branches. The corallites are covered with a tissue, called the coenosteum. The polyps of the Black Sun Coral are very fleshy, and extend mostly during evening hours, though they can be coaxed out during the day if food is present. Its tentacles are greenish black to brownish black with the coenosteum being olive green to brownish black, and the very center of the polyps being the same color as the coenosteum. During the day the coral is completely withdrawn and only the dark coenosteum is visible, making it look like a tree with raised round flat nubs all over the branches. It is said these corals only grow 1.6" a year (4 cm). Life span is unknown. Difficulty of Care Tubastraea Coral Care: In generally, the Tubastraea genus can be easy to moderate to care, for depending on the dedication of the aquarist. However the Black Sun Coral is moderately difficult to care for, as iIt is near impossible to provide the extreme water movement and extreme amount of food needed for its captive survival. It is best left to advanced, expert aquarists. An alternative dark version of this genus is the non-branching Brown Cup Coral T. diaphana, which is a dark brown color, which is easier to care for. In captivity, the Black Sun Coral needs to be fed twice to 3 times daily. Feed decent sized foods like enriched live or defrosted, or freeze dried adult brine shrimp, mysis shrimp, and other similar sized prey. Soak the food in a vitamin supplement. If they are well fed, they get a "bloated" look. Aquarium Parameters A well-feed live rock/reef environment is what is needed for the Black Sun Coral, along with some fish for organic matter production. A mature tank is recommended. They need to have a very strong water movement, yet are tolerant of lighting in the aquarium. A strong skimmer is recommended to take care of the nutrient load added by the heavy feedings needed for these corals.This is a peaceful species, but other corals may not be, so provide adequate space between species. Compatibility and Social Behaviors The T. micranthus is peaceful towards other corals. However they do not have strong stinging tentacles, so need to be kept away from other corals. The only impact they will have on other corals is connected to their need to be fed large amounts of food, that may foul the water. In captivity, propagating the Tubastraea genus can be done by breaking off pieces from a healthy colony. Another way is to keep the coral well fed with good water flow, and let it propagate by itself. Potential Problems Light will not harm the Tubastraea species, but they do not have a very good defense against algae. Algae grows fast in lit areas, and if algae is allowed to grow on the T. micranthus, it will die eventually. Strong water movement is a must. Putting the coral in areas under ledges that usually do not have the water flow they need, can also cause algae growth. Availability Tubastraea Corals for Sale: The T. micranthus is easy to find at pet shops and on line. Online they can run about $36.00 USD or more depending on size and/or color.